Have you ever kept something a secret for a long time? You walked around every day, desperate to talk about it but terrified of what everyone would think. That's where I'm at right now. I've been working on a huge project. Only a few people knew about it, but it's consumed a lot of my time and energy over the past few months. I wrote a book. Well, it's the beginning stages of a book, anyway. It's a rough draft. There's a still massive amount of work to be done. This past Saturday I finished the draft. I even typed "the end" just so I could have the satisfaction of seeing those words. I was so excited. Months of work and years of dreaming culminated in my first novel. I told my husband, my critique partner, my writing group. Emails and Facebook messages flew back and forth as they helped me celebrate the milestone. I was walking on air. Until Monday night. That's when reality set in. I pulled out my laptop, ready to start some edits, when it hit me: Oh my word. I wrote a book. Now what do I do with it? I spent months plotting, researching, and typing. I made up characters with complex histories and motives and agendas. I can tell you what each character looks like, what they sound like, what motivates them, and what they fear most. I brought this story to life. Technically, I know what's next: Edits. My critique group. Lots of coffee. Probably some tears. Writing contests. Polishing. Then the search for agents and publishers and (hopefully) a book contract. But that isn't what scares me most. This novel is mine: my story, my ideas, my dream. It's fiction, but like any writing, it's intensely personal. Up until now, this story has lived only in my head. Now I'm launching it into the world. Other people will read it. They may like it. They may not. In fact, I know already that some people will hate it, because that's just the nature of the beast. No matter what we do, we can't please everyone. I'm letting people see a part of me that's been hidden for such a long time, and I'm opening myself up to criticism. That's scary. But my dream has reached a point where it can't stay hidden anymore. Rough drafts can be written in secret. Dreams can be hidden for a while. But if dreams are to become reality - or even have a chance of becoming reality - they have to take wing. 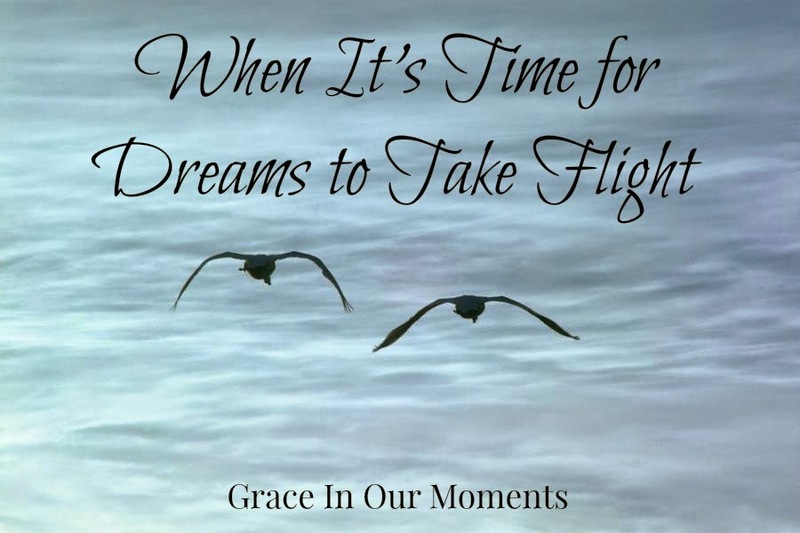 It's time to push my dream out into the world and see if it's fragile wings can catch the wind and take flight. It's been almost two years since I wrote about being a dreamer. Now it's time to take the dream to a new level. I'm standing on the edge, looking into the unknown and seeing only a terrifying freefall. All the while, I hear a quiet whisper, "It's time. I've got this." God have me this dream. He called me to it. Now it's time to trust and take the leap. I'm scared, but I know my Father's courage will carry me through. It is so scary to come up with a big piece of writing like that and then to get ready to launch it into the world. So proud of your bravery! Keep us posted on the process! Amanda, I can so relate to your words here! Never was I so happy as when I put "the end" to my stories which are now The Glade Series (www.gladetrilogy.wix.com/theglade). And, like you, God gave me the dream of writing, pure and simple. I won't tell you it will be easy to edit, find a publisher, etc. There will be disappointments and heartaches. But, if you ever remember that God's hand and His timing are in it all, you will get through the process and come out on the other end an enriched person. Blessings to you and yours, and God speed with the new book! So proud of you! I'm truly inspired! Woot! Woot! Good for you! It's an awesome feeling (just make sure you give it plenty of time to 'rest' before you tackle the edits!). I love reading and reviewing books. I sometimes receive books (e-books, ARC, or print copies) for free by publishers, authors, and/or publicity groups. A positive review is not required. Every book I review, regardless of whether sent by the publisher, author, publicity group, or purchased, will receive an honest review.